The gates are creaking. Wind is howling through the trees. Rattling chains roll over wet leaves. Those grunting noises are drawing nearer. A guitar squeal echoes in the distance. SUMMON THE WAGONS. IT’S THAT TIME, DISCIPLES OF TNUC. 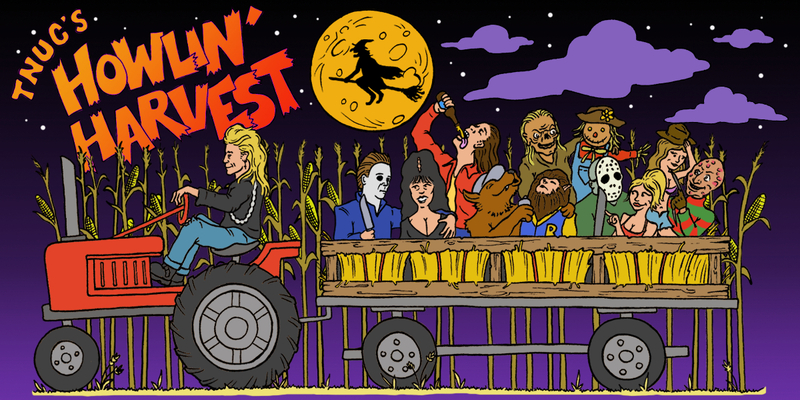 TNUC’s Howlin’ Harvest is a horny hayride featuring some of our most beloved, bewitched and bastardly characters all seated on the back of Manimal’s tractor, ready to party down in your fair town. Every evening in October, after a long day of chasing innocent victims and scaring the bejesus out of snotty teenagers, these babes ‘n boogeymen climb aboard Manimal’s hayride and gallop deep into the night. Where are they going? Our best guess is to that old Victorian mansion on the hill. By Halloween night, that place will be the biggest monster mash from Timbuktu to Portland, Maine. Or Portland, Oregon, for that matter. But what the word “harvest” truly represents this season is a personal feeling of AUTHENTICITY. You see, Uncle T recently relocated from an area of the country where a true Autumn was pretty much nonexistent. Sure, we had Halloween and loved it to death, but the PURENESS of the season was absent. Let’s just say, going about your day in 90+ temperatures and surrounded by palm trees in October will slowly rip your soul apart. For someone who celebrates Halloween all month long, I hungered for, no, CRAVED things like fall leaves, cider donuts, apple orchards, hayrides, ancient graveyards, foggy forests and chilly Octobers. I needed it to feel pure again. I needed to be in a place where I can go for a spooky walk around town whenever I damn please. This has now been made possible because the TNUC lair has relocated to the heart of New England aka AUTUMN DREAMLAND. For a crusty old Uncle like myself, it doesn’t get much better than this. With that said, my approach with TNUC this season is to completely feast on all of Autumn’s offerings. These articles will be a reflection of that and I urge you disciples to do the same, wherever you are. Go for long drives, get lost, explore an eerie abandoned location, eat Halloween junk food, read a scary book, go for spooky walks at night, visit with the loonies at the mental hospital, fill your house with dry ice, watch horror movies on a grainy TV, build a backyard haunt, stay overnight in a haunted inn, binge on pumpkin beer, find a corn maze…or do nothing but stay tuned to uncletnuc.com! Big thanks to Cody Kaufman for once again crushing this year’s artwork! If you happen to be wearing a bandanna and a loin cloth in a room full of mandalas, rain sticks, feathers, bamboo, and pet snakes I suggest you listen up. At this moment, if you happen to be sitting in the lotus position, enveloped in a thick haze of incense, with visions of soaring hawks, crackling fires, ancient warriors, and ruined jungle temples I suggest you listen up. If you happen to be grinding down your shins by kicking a cement pole, a banana tree, or a hanging long bag, I suggest you drop into a split and listen up. Relax, take a deep breath, take that bandanna and make it a blindfold, empty your mind, prepare it for liftoff, then begin to move slowly, gracefully, as light as the rabbit, as strong as the mighty buffalo. Good. Now the stage is set. Mind and body are united, chi is flowing in your veins. Next, make sure you have put the wife and kids to bed, firmly close all doors between you and them, turn on the washing machine, move the brass vases and wicker furniture to the other room. TO DO A PROPER ROUNDHOUSE KICK it is essential that you stay on the balls of your feet, then in an explosive thrust you must fire from the hips, pivot on your lead foot, throw your arms back, let heavy leg fly and follow through with your whole being. TO THROW PROPER ELBOWS, you must envision the points of your elbows like the point of a sharpened dagger. Then you must extend your arm, palm first, rotate your foot, then launch from the shoulder, slicing down with your elbow. Thank you Mr. Hertzog for this new spirit vessel. Uncle T is the last guy you’ll hear complaining about the summer. He cherishes the heat, loves the ocean, the babes, the smell of sunscreen and a good old fashioned ketchup & mustard & hot dog food fight on the beach. Having said that, I also follow the philosophy that when summer needs to go…IT NEEDS TO GO. It used to be exclusively October, but now when September hits, all I thirst for is chilly nights, foggy graveyards, witchy women, rubber bats, creepy basements, Elvira’s cleavage, moonlit metal, ceramic pumpkins and night rides to that old victorian mansion on the hill with the iron gates. So before autumn hits and TNUC is seen galloping into the night screaming “I’M HERE LORD!!! I’M READY!! !” like one of those loony cult kids in 1984’s Children of the Corn, we should probably bid a proper farewell to summer. We’re ending summer 2018 on a positive note. Here’s a bouncy, soothing number that didn’t make it on Camp TNUC’s Official Summer Mixtape. It’s the seldomly mentioned ending theme from Nickelodeon’s hit TV show Salute Your Shorts. SEE YOU DISCIPLES THIS FALL. Summer Commercial Break Part 3: NERF! We’ve arrived at the juggernaut of summer toy franchises, the almighty NERF. While NERF guns are as much outdoor toys as they are indoor, running out the backdoor to blast friends hiding behind trees, tree forts and lawn bunkers was the ultimate. If you grew up in wet and snowy climates during the winter and spring, nothing was more rewarding than the first hint of summer weather to annihilate each other with foam based weaponry. The most popular products are NERF blasters, which are toy plastic guns that shoot foam darts or balls. Some have suction cups, some whistle in flight, color swap, camouflage or glow in the dark. As you’ll watch in the commercials, it’s amazing how long NERF has been going strong. From 1970 to modern day it’s probably the biggest household name in the toy business. Summer Commercial Break Part 2: SUPER SOAKERS! Let’s face it people. If you grew up in a certain era like myself, Super Soakers were a HUGE goddamn deal. Nothing brought neighborhood kids together better than a water gun fight in the dead of summer. We held onto our Super Soakers like precious pieces of golden artillery. The tale of the Super Soaker begins in the early 1980s with a NASA engineer named Lonnie Johnson. While working on and testing a heat pump system in his bathroom, a powerful stream shot from his prototype, with Johnson immediately realizing that this could make a great water gun. He spent the next eight years trying to sell the idea. Eventually, Johnson sold the idea to Larami Toys, and they released the Power Drencher. The Power Drencher wasn’t very popular at first, but popularity grew significantly when they renamed it the Super Soaker 50. I couldn’t possibly continue explaining the entire history of this legendary toy, but this article sure can. When you’ve finished browsing through my favorite commercials, check that out! Now to really make your head explode, feast your eyes on this intense (but geeky) Super Soaker collection from a guy named Chris Reid. More photos here. Summer Commercial Break Part 1: SLIP ‘N SLIDE! With last month’s riveting release of Camp TNUC’s Summer Camp Mixtape, let’s keep the party going with the best summertime toy to ever hit the backyard…SLIP ‘N SLIDE! First introduced in 1961 by the company Wham-O, “slip ‘n slides” exploded into the mainstream during the late eighties with multiple companies getting in on the fun. Which slide was your favorite? Watch the following commercials, bask in the memories and let us know!